"A piano trio is one of the mainstays of the jazz tradition, and these cats are a fine example of the fun that such a combination can create." About ten years ago pianist Matthew Fries, bassist Phil Palombi and drummer Keith Hall came together to become the rhythm section for vocalist/saxophonist Curtis Stigers. They enjoyed playing together. It felt natural, and thus was born TRI-FI. 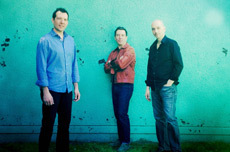 Staring into the Sun (Tri-Fi – 310) is their fifth album. It has ten tracks, all originals by the band members, six by Fries, and two each by Palombi and Hall. They all have a strong feeling for melody. As a unit they reflect the kind of unity that comes with playing together for ten years. Fries is the major voice, and he is a consistently interesting player. Palombi and Hall provide solid rhythmic support. A piano trio is one of the mainstays of the jazz tradition, and these cats are a fine example of the fun that such a combination can create.